The Y&R Update Friday 10/22/10--Canada; Monday 10/25/10--U.S.A.
At Tucker's Diane tries to discredit Phyllis' article. She tells Tucker that it's tabloid journalism written by someone with an agenda. Tucker is unmoved, and says he found the article informative, and points out that Phyllis and Restless Style could be sued if the article was false. When Diane persists, Tucker asks her if she's saying that Phyllis made up the things she claimed about Diane. Diane says she isn't that person anymore  she changed for the better for Kyle's sake. Tucker says she lied about her work experience. She wasn't a partner, or the founder of the company in Toronto, and she wasn't the lead architect on the projects as she lead him to believe she was. Diane says she did work on the projects, and was about to become a partner before she left town. Tucker says he has to trust his employees, but doesn't trust her. Diane pleads, saying he can't do this to her, when she just uprooted her son due to his offer. When Tucker won't change his mind, Diane says he got what he wanted, and now he's finished with her. Tucker says she's not who she claimed to be. Desperate, Diane asks Tucker what Ashley would say if she found out he wasn't who he claimed to be, either. Tucker asks Diane if that's a threat, and she says she'll keep quiet about their one night stand if he hires her. Tucker is unfazed, and says if she tells Ashley, he'll say Diane made it up because he fired her, and he's confident he'll be believed. Diane starts to swear at Tucker, but he mockingly reminds her that she's supposed to strive to be someone her son would look up to. He then shows Diane out, and tells her to think twice about threatening him again. Diane is shaken, and near tears. Jack and Phyllis are at Restless Style having a heated argument about the article Phyllis wrote about Diane. He tells Phyllis that she's the problem, not Diane. Jack says that he asked Phyllis not to target her, and he's angry that she wrote about all the trouble Diane caused, because it was in the past. Phyllis doesn't see the problem, since everything in the article was true, and as a journalist, she couldn't pass up the chance to tell the story. Jack tells Phyllis that this is beneath her. She responds that he would have published that kind of story when he was running the company, and Jack says that's why he left. Jack realizes that Phyllis isn't sorry, and says he thought she'd be remorseful for what she's just done to his life. Phyllis yells that she's glad she wrote the article, and is looking forward to seeing what it does to Diane. Jack says he'd forgotten how selfish Phyllis could be, but Phyllis says she did this for him. Jack points out that he asked Phyllis to leave Diane alone, but she didn't listen. Phyllis says she has her own brain, and is surprised that Jack can't see that Diane is taking advantage of him. Jack doesn't think Diane has done anything, except bring Kyle back to him. Phyllis says Diane has a plan, is using Kyle, and deep down inside, she thinks Jack knows it, too. Jack says this is exactly what he didn't want, but Phyllis says she struck first, so Diane would know not to bother them. Jack asks if Phyllis knows why he didn't want this, and exasperated, Phyllis says because of Kyle. Jack corrects her and says it's because of his relationship with her. He didn't think he and Phyllis would ever have another chance, and he doesn't want Diane in the middle. Phyllis says Diane would have come between them eventually, and that's why she did this. Jack asks why she couldn't trust him not to let that happen. Phyllis says that she knows how Diane works, and she would have used Kyle to get to Jack. Jack yells that he's not going anywhere. Phyllis starts to doubt that, then Jack complains about not ever getting the last word in. The frustration builds, and ends with Jack pulling Phyllis into a passionate kiss. They end up making love on a desk. Jack and Phyllis start redressing, and Phyllis tells Jack that that is what she's fighting for. Jack doesn't agree with her methods, but Phyllis says she doesn't know how else to go about it. They start to kiss again, when Diane storms in. She angrily asks if Jack, who's putting on his shirt, was rewarding Phyllis for the article. Jack tries to respond, but Diane tells them that they both disgust her. Diane picks up something off the desk, and hurls it at Jack, and begins to scream at them. Jack tries to calm Diane down. Diane calls Phyllis a vindictive liar, but Phyllis tells her every word of the article is true. Diane says Kyle might see the article, and Phyllis says she should have thought of that before she slept around, stole sperm, and burned down the Abbott pool house. Jack holds Diane back, as she asks him if he's going to let Phyllis get away with this. Phyllis says Diane hurt her son by coming back to Genoa City where he could learn the truth. Diane and Phyllis argue again about whether Diane brought Kyle back so he could bond with Jack, or as a way to manipulate Jack. Phyllis taunts Diane, saying she should receive an award for telling everyone the truth about her, and says that Jack just thanked her. Jack steps between them, to stop them from getting to each other. Diane screams that she won't be ran out of town by Phyllis, and Phyllis says to watch and see. Diane threatens to hit Phyllis and Phyllis smiles, and tells her to 'bring it on.' Jack yells at them both to stop, and tells Diane to go get Kyle. He says that the two of them will meet later, and explain things to their son. Diane says she can take care of her son, on her own. She says the article cost her the job with Tucker, and the next job she finds might not be in Genoa city. Jack says he'll help her find a job, but Diane says she doesn't want his help, or want him to be in her and Kyle's lives. Jack says he's upset with Phyllis just like Diane is, but Diane says she warned him that Phyllis was toxic, and doesn't want that around her son. Jack says she can't keep him from Kyle, and Diane tells Jack that he's chosen his side, and now he has to live with it. Jack tells her not to use Kyle. Diane says that she didn't start this, and tells Jack he knows where the blame should be placed. She leaves, and Jack turns and stares at Phyllis. Jack starts to go after Diane, but Phyllis tells him to wait. She says that as a mother, she knows Diane wouldn't keep Kyle from him. She says Kyle is a great kid, and it's obvious that Diane loves him. Phyllis says that Diane brought Kyle back to be close to Jack. Phyllis says to stay calm, and wait, because when Kyle starts to miss Jack, Diane will bring him to see him. Phyllis says when that happens, it will be up to him to keep Kyle in his life, and keep Diane out. Jack nods. Daniel is at Crimson Lights, sketching something, and leaving a phone message for Abby. He tells her that he wants to tell her what's been going on with him, and catch up with what's going on in her life, mentioning that he knows she has mediation with her father today. He also says that he's been thinking about her, and asks her to call him. Vance Abrams stops by Victoria's house to help her and Abby prepare for the meeting with the mediator. Abby asks why they have to go to this meeting, when they've already turned down the settlement offer from Victor. Vance says that it's court ordered, and doesn't mean they can't get what they want. Victoria says they want control. Vance asks what they're willing to settle for. Abby starts to answer, but Victoria cuts her off, and says 'Beauty of Nature.' Abby is shocked. Victoria hands them portfolios she put together that show Beauty of Nature's earnings and operating costs. Vance asks where she got the information, and Victoria says she had some files in her laptop from her time working at Newman. Abby is unimpressed, and asks if this is all Victoria wants to ask for. Vance tells Abby to believe him, this is a lot. Abby asks if she's supposed to give up her shares of Newman to be co-owner of a cosmetics company. Victoria tells Abby she's not looking at the big picture, but Abby says she wants a large check that she can use to start her own company, by herself. Victoria says that if they can get Victor to give them this company, Abby will have enough money to do whatever she wants. Victoria says Abby might not have planned to get the money that way, but as long as she ends up with it, it doesn't matter how it came. Abby rants that the lawsuit was her idea, but now it's suddenly all about Victoria. Victoria says to trust her  she knows the industry, has shown Abby the numbers, and knows that their father won't give them a better deal. Vance agrees, and points out that Beauty of Nature is very profitable, and could make them very rich. Abby asks why Victor would hand the business over, if it's worth so much, and Victoria explains that if he doesn't he'll lose even more in court. Vance says Victor's not stupid, and will see this as a good option. Abby agrees to settle for Beauty of Nature, but is not happy about it. Victoria says it's going to be great, and tells Abby that she'll see, eventually. Victoria walks Abby to the door, and reminds her of when the meeting is being held. Abby tells Victoria that she knows, and is not an airhead. Victoria again tells her that this settlement will be good for both of them. Abby says she guesses so, and starts to say something else, but Victoria closes the door before she can. Frustrated, Abby calls Daniel, wanting to see him. He thinks she got his message, but she hasn't. He tells her where to meet him. At the Ranch, Nick calls Victor, saying he stopped by to see him and Nikki off on their elopement, but they weren't there. Nick thinks they've left already, but Victor tells him that the wedding is on hold because Nikki has been drinking. Victor is with Nikki at a rehabilitation center called Solidarity House, and tells Nick to meet him there, because Nikki needs the support. 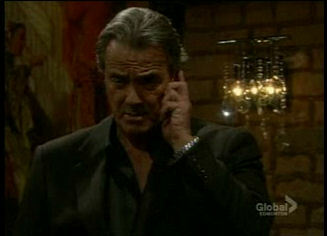 Victor and Nick end their call, and Victor receives another call from Meggie, who's with Deacon in his room. She pretends to be concerned about having found Nikki in Deacon's hotel room. Meggie then offers to pick up some of Nikki's things from the Ranch so she can have them in rehab. Victor thinks it's a great idea, and tells her where Nikki will be staying. Meggie repeats the name of the center so that Deacon can hear it, and hangs up. Deacon panics, because he thought Victor would kick Nikki out, not check her into rehab. Meggie calmly says she knew this would happen, and that's why she's in charge of their plot. Deacon wonders why they did this, if Nikki was going to rehab, and Meggie explains that it postponed the wedding. She says she has to go get Nikki's things, and tells him she'll explain 'phase 2' of the scheme when she returns. Victor goes into Nikki's room at Solidarity House, and finds her crying. She says he must hate her, but he says he doesn't. Nikki says she hates herself for ending up drunk and in bed with Deacon. Victor asks what happened, and Nikki says she doesn't know. The last thing she remembered before Victor got there, was drinking with Deacon. Nikki explains that she's been drinking for about a month. Victor is surprised, saying he didn't notice. Nikki feels bad because when Victor did notice, she lied, because she wasn't able to admit the truth to anyone, including herself. Victor feels guilty that she was going through this, and he didn't help her, but Nikki tells him that he's not to blame. She says she thought that if she could get through the wedding, she could overcome her problem. Victor puts his hand on her shoulder, and tells her that she's going to get through this. Nikki says she wants to. Victor says he believes in her, and she has to believe in herself. Nikki and Victor finish a tour of the facility, and the psychiatrist tells them that they will develop a program to suit Nikki's needs. The psychiatrist asks to interview Nikki, and Victor decides to step outside to give them privacy. Before he goes, he kisses Nikki, and tells her that she can do this. Outside, he runs into Nick, who's just arrived. Nick asks how this happened, and Victor says he doesn't know, but feels they must support Nikki. Victor says Nick can see her after her interview. Nick asks about Victoria, and Victor says he didn't call her, and doesn't want Nick to, either. Nick says he's going to tell his sister if Victor doesn't. Victor says he plans to tell her; he wants to do it in person, and to let her know how important it is that the family sticks together. Nick asks Victor if he knows Victoria isn't at fault for what happened with Nikki. Victor says he'll deal with it. Nick says to tell Victoria soon, or he's going to do it. Victor says not to worry about it. The psychiatrist, Dr. Carey, leaves the room, and Nick goes in to see his mother. Meggie arrives with Nikki's suitcase, saying she packed enough things for thirty days. Victor confirms that that's how long Nikki will be staying. Meggie says she's sorry they won't be going on the wedding, and Victor thanks her, but doesn't seem interested in talking about it. She leaves. Nikki tells Nick how horrible it is to have him see her in rehab. He asks if the fighting between Victoria and Victor caused her relapse. Nikki says she doesn't know what happened. The family has been through worse than this, and she hasn't relapsed, so she doesn't understand why the cravings came back. Nick asks why she didn't go to him, or anyone for help. Nikki tells him about meeting Deacon in AA, and turning to him. Nick is disgusted, but Nikki says it wasn't Deacon's fault. She blames herself for not going to someone she could trust, but Victor and Kay were preoccupied with their own problems, and she didn't want Nick or Victoria to know. Nikki says she's let everyone down, especially Victor. She talks about the look on Victor's face when he found her with Deacon, and knows he seems calm, but is afraid of how he really feels. She doesn't see how Victor couldn't hate her. Nick comforts her. Victor comes in with Nikki's things, and tells her that Meggie brought them. Nikki says Meggie is a good friend. Nikki says she wants to take as shower, and Nick leaves, promising to come back later. Victor hugs Nikki, and holds her close. Nikki comes in from her shower, and Victor asks her if she feels better. No, she feels worse, because they should be in Vegas getting married right now. Victor tells her that theyre both where they're supposed to be. Nikki tells him that he was right before, and she has to be strong. Victor tells her that the next thirty days will be hard, but he'll be with her every step of the way. She asks if he promises to be there, and he does. Meggie goes back to Deacon's room, and he tells her he's not interested in phase 2 of her plan. He's fuming, because he thinks held up his end of the bargain, getting Nikki drunk and in bed with him so Victor could see it. Meggie tells him he's not even close to having held up his end of the deal. Deacon says he expected Victor to chew him out, but Victor's silence scared him, and he doesn't want to be around when he snaps. Meggie tells Deacon that if he wants money so he can reunite with his 'brat,' he'll listen. She tells him that Nikki is in Solidarity House. Deacon says that it's a very expensive facility. Meggie tells Deacon to get ready to spend some money, because he's going to be checking in there, as well. Deacon says Victor would kill him if he found him sneaking alcohol into rehab for Nikki. Meggie says not to let Victor find out. Deacon doesn't like the plan of her getting close to Victor while he does something dangerous. Meggie says it will only take a couple of drinks to break up Victor and Nikki, if Victor thinks she's throwing away her second chance. Meggie explains her fantasy of living the life of Mrs. Newman, with expensive clothes, luncheons and writing big checks to those in need (meaning Deacon). She asks if he's still in, and he hesitantly says yes. Daniel and Abby meet at Gloworm. He's ecstatic, because he'd just been commissioned to create sixteen paintings. Marc Fletcher, the art consultant Abby brought to Daniel's art show, put him in contact with the gallery owner who commissioned them. Abby is thrilled for him, and says he owes it all to her. Daniel teases her about her lack of modesty, but agrees that she deserves the credit, and buys her lunch to thank her. He mentions that she was upset on the phone, and asks if it's because of the way Tucker is treating Ashley. Abby says that's part of it, but it's mostly because she's not sure if she can trust her sister. She says Vance and Victoria have teamed up and taken over the lawsuit. Abby doesn't like their plan, but doesn't want to look stupid in front of them, because they're the experts. Daniel sympathizes, and says he'd probably feel the same way. Abby says she's so angry, and Daniel asks if she's upset at them, or at herself for agreeing to the plan when she doesn't want to. Abby says she didn't cave, she made the decision to follow Victoria's and Vance's lead. Daniel says Abby's not a follower; she does her own thing, which is an annoying trait but he's come to admire it. Daniel says he wouldn't have his commissions if not for her doing what she wanted. He tells her that it's her lawsuit, and if she doesn't like the direction it's going in, take it back. Victoria goes to Tucker McCall's office, and tells him she has a proposition for him. He's surprised to see her, because she wasn't interested when he offered her a job at Jabot. Victoria says she's not interested in working for him, but could be interested in working with him. Tucker thinks Victoria has her father's boldness. Victoria says that's the only thing they have in common. She says she's her own person, who will soon have her own company. Tucker asks if Victor gave her a consolation prize to settle the lawsuit, and Victoria lets him know that she hasn't settled yet. She tells him that she's asking for Beauty of Nature. Tucker asks what this has to do with him. Victoria says she knows Tucker is interested in the company. She's impressed by his handling of Jabot, and wants to merge the two companies. Tucker says it would be like a cosmetics empire. Victoria says she'll only go along with the deal if he agrees to let her run the resulting company. Tucker is intrigued by the offer, but says he already made promises to Jack and Ashley. Victoria jokes that she's sure he's broken promises before, and tells him that if he wants Beauty of Nature, she wants to be CEO. He tells her to bring him the company, and they'll talk. Victoria's smiles, and says she'll see him soon. Victoria and Nick run into one another at Crimson Lights. They chat about JT, who's still in the same condition, and Victoria talks about trying to make things easy for Reed. She then brings up the mediation she has with Victor the next day, and says their parents must be on their way to Vegas by now. Victoria says she can't believe Nikki is going through with the wedding. Nick quickly says he has to go, and walks out, leaving Victoria looking confused. Kyle and Diane are at Crimson Lights, and he's tells her that he aced his entrance exam for Walnut Grove Academy. He's very excited, and says he couldn't have done it without Jack's help. He asks if he can call Jack so they can all celebrate together. Diane pretends everything is fine, and gently says that she spoke to Jack, and he's going to be busy all day. Kyle suggests that the two of them celebrate him getting into the school, and her signing her contract. Diane tells Kyle that she gave it more thought, and decided not to go to work for Tucker, but will find something even better. Kyle is sure she will, and tells her she's awesome. He goes to the counter to order something, and Diane's face falls. She says she has no money, no job and no prospects, and wonders if things could get any worse.